In my last post, I wrote about our trip from Milan to the Cinque Terre and our hike through the five villages. We had a really wonderful time on the coast, though I was looking forward to seeing Florence for the first time, a city that many of my friends and family members say is their favorite in Italy. We got to Florence late on Tuesday night with just enough time for a quick bite at a local restaurant before bed. Though I love food and largely base my vacations around what foods I want to try, I didn't make any restaurant reservations before arriving in Italy. In fact, I rarely do unless I've been to a city before and know where I want to eat. I usually write down the top Yelp hits and use Yelp while I'm traveling, but I often prefer to rely on the recommendations of tour guides and locals to keep myself open to great finds like Restaurant Le Royal Vendôme on our last trip to Paris. We woke up on our first full day in Florence a bit sore from all the hiking, but ready for lots of tasting. Ever since our food tour in Prague, we try to look for either a food tour or cooking class (or both) in every city we visit. I find that food is, for me, the best way to learn about a city's history and culture. We chose the Florence Food Tour because of the breadth of foods offered and the positive reviews on Trip Advisor. ChiaroScuro: We stopped at this little café to begin our tour with some espresso. Valentina told us that espresso came to Italian cafés in the late 19th century. Most espresso is made from about 80% Arabica beans from Mexico and 20% Robusto beans from India. That's because the Arabica beans produce a pleasing chocolaty taste while the Robusto beans add a stronger, creamy taste -- but also contain twice the amount of caffeine. We tried both kinds of beans separately, which was neat to taste the difference. Valentina also told us that generally Italians only drink cappuccinos for breakfast (not after 11:30), but that it's okay to have an espresso (usually just 1€) or a macchiato all day, especially the later with sambuca. Procacci: Our next stop was to Procacci for truffle sandwiches made with a paste mixed with black and white truffles. I'd never had truffle paste on plain bread before, and I liked how the bread showcased the truffle flavor while also softening their pungency. This little shop from 1885 specializes in everything truffle, which run about 1,000€ per kilo for the black variety and about 10,000€ per kilo for the white variety. Truffles mostly come from the Piedmont region of Italy along the French border, with truffle season falling around October or November. Valentina told us that because fresh truffles really only last for two to three days, she prefers truffle oil for cooking. But if you do get ahold of some fresh truffles, try them with fried eggs, which she claims is the best for bringing out their flavor. Antica Pasticceria Sieni: After our sandwiches, we went to this café for some Italian pastries. Valentina told us that everything is made fresh daily, so you have to go early in the morning to get the good stuff. We ended up eating a "Cake of the Czar", a caramel-flavored cake with sabaglione and soaked in a kind of liquor. We also got to try some fresh Italian panforte with almonds, cinnamon, and orange peel, though Valentina told us that it's usually only eaten around Christmas time. Though I've seen panforte at the grocery store, I'd never tasted it until just then, and now I know that I probably wouldn't mind eating it all year round! Pany da Lory: Valentina took us here to try some of the schiacciatella, a really salty kind of Tuscan bread that works great as an appetizer or snack. Most Italian bread is not salty, she told us, so that it pairs well with cured Tuscan hams. Schiacciatella, however, breaks the trend. The bread we tasted was long and crusty on the outside like pizza dough, but with a drier fluff in the middle. I preferred the plain kind, but we tried another kind with olives that was also tasty. Bottega Marconcini: At this next stall, we camped out for a bit at a small, pop-up table as Giulia, one of the shop's young sellers, talked us through a tasting of Tuscan olive oils, balsamic vinegars, and wine. We tried two kinds of extra virgin olive oil: a Laudemio olive oil made from the same olives harvested in November with less than 36% acidity and a more delicate taste and another Fatorrie Pari Tuscan olive oil that blended three kinds of olives and thus had a more bitter taste, making it better for cooking. Next we tasted some fresh strawberries with a thicker, sweeter balsamic vinegar aged 8 years and parmesan cheese with a lighter balsamic vinegar from Modena aged 5 years. Giulia pointed out to us the crowns on the bottle which tell you how many times they've changed barrel. Apparently the extravecchio (extra-old) vinegars aged for 25 years in small barrels carrying the DOP label are the best for digestion and can cost up to 98€ for 100 ml! Next we drank a Bolgheri wine from the Livorno region on the coast. This heavy-ish wine blend consisted of cabernet sauvignon, merlot, and syrah grapes grown in very mineral coastal soil and aged in oak barrels (as opposed to a traditional Chianti which is lighter and aged in steel barrels). To go with our wine, we nibbled on prosciutto from Tuscany. Though the Italian parma is probably the most famous, Giulia told us that Tuscan ham is saltier, contains less fat, and usually sells for a bit cheaper. Finally, at the end of our tasting, we tried the traditional Tuscan dessert of vin santo and cantucci. Valentina was very careful to tell us that the oblong cookies that foreigners usually call biscotti (which is the general word for cookie) are really cantucci from a specific city called Prato. As a dessert, they are dunked in sweet vin santo (or "holy wine") made from grapes picked sometime in September through January and then aged for three years so that the grapes retain much of their natural sweetness. The bottle we tried came from the 2004 harvest and was 14.5% alcohol-by-volume. The cookies and sweet wine are a typical dessert for Sunday lunch. Da Nerbone: Lastly, we stopped at Da Nerbone, the oldest shop in the market dating from 1872, to try a dish of simple pasta with eggplant. Ironically, perhaps, this one was easily one of my favorite dishes of the tour: lightly sauced, perfectly cooked al dente penne but with big flavor. A full portion of the pasta cost just 4€, making this a popular lunch special. 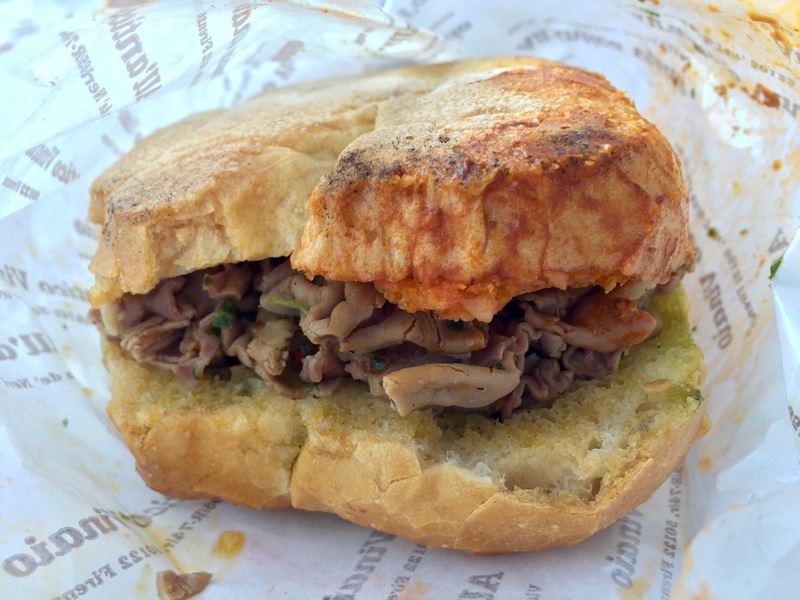 The shop is most famous for their lampredotto sandwich, though, and Valentina told us that on Saturdays during the high season, the line can cut through the market with up to an hour waiting time. 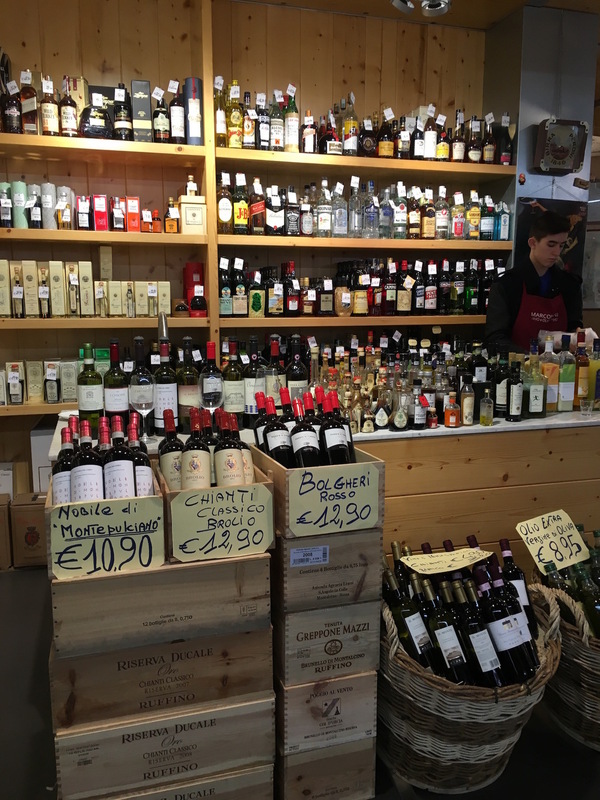 La Divina Enoteca: Just next to the market, we stepped into this little wine shop owned by one of Italy's best sommeliers. Valentina told us that he rarely smiles, but he sure lit up for us when talking about the new award he'd just one. Part of the reason for his renown is his shop which includes quality wine from a number of small-production vineyards, and so you can't find many of the wines outside of Italy. We first sampled a glass of Vernaccia di San Gimignano, a dry white wine from a village between Florence and Siena featuring more fruity flavors of pear and apple. He paired the wine with a slice of bread spread with bell pepper cream and a slice of fresh cow cheese with pear and grappa jelly. Next we tried an Istine Chianti Classico made from mostly sangiovese grapes and with flavors of cherries, violet, and rose. It was a good, every day wine that paired nicely with salami with fennel (finocchiona) from Florence and pecorino cheese (sheep's milk) aged two months with a skin of tomato sauce. We also learned that chianti must be 80% sangiovese grapes plus two or more other grapes to be considered a pure chianti. If you're unsure, though, just look for the black rooster on the bottle which acts as a kind of sign of quality. Antica Gelateria Fiorentina: What better way to end the tour than with gelato? While I was tempted by the matcha flavor, I opted instead for the more traditional pistachio and cinnamon flavors, while Matt settled on a decadent dark chocolate and coconut. While we savored our creamy treats, Valentina advised us to look for gelaterias specializing in small batch flavors with fresh ingredients made daily, meaning that we should avoid shops with the giant mounds which she said are not quality. She also reminded us that unlike ice cream, gelato does not contain preservatives and is therefore healthier (hah!). The amount of food on our Florence Food Tour was perfect; I didn't feel overly stuffed as I've felt on some tours, but still felt satisfied by the portions and wowed by the variety. Valentina was also really funny -- she even joked that our first tasting would be Italian vodka, much to our confusion. As we were leaving, she also gave us a great recommendation for dinner to try Florentine steak. After the tour, we had had extra hour or so to walk around Florence. I should note that in general, most of the people we encountered spoke at least some English, so we never had any language issues even though we didn't speak Italian. Of course, basic phrases like buongiorno, ciao, mi scusi, per favore, grazie, prego, Quanto costa?, Parla inglese?, Prendo vino rosso, and Che cosa mi consiglia? all went a long way. We decided to check out the Duomo and see what all the fuss was about. I found the exterior to be absolutely stunning with its many colors of marble and large brick dome (the largest ever constructed!). We did go inside, but I found the stark Gothic interior to be rather underwhelming after the opulent impression given by the exterior façade. Our next stop was to the Galleria degli Uffizi. On recommendation from friends of ours, we purchased our tickets in advance and skipped the long line. The museum was massive, and contained many of the great Italian works of art that I remembered learning about in my art history class, such as Simone Martini's Annunciation, Sandro Botticelli's Birth of Venus, and Raphael's Madonna of the Goldfinch. The architecture of the museum (an office building from 1581) was just as lovely, and we got a great view from the café of Florence's famous Ponte Vecchio (or old bridge). After spending a couple of hours in the museum, we made our way across the Arno River for a leisurely stroll up to Piazale Michaelangelo. We'd been told it was the best view in the city, and so we tried to time our visit with the sunset. We had to wait a bit, but enjoyed relaxing with other couples and families on the grass after a long day of walking. In fact, we found Florence to be a very walkable city. We never had to buy train tickets, and did not get lost thanks to the many recognizable landmarks. Having watched the sunset and fully digested after our earlier food tour, we made our way back down to the city center to try to get a table at the restaurant that Valentina recommended to us: Buca Lapi. Valentina stopped at this little restaurant around the corner from the Palazzo Antinori to show us the tiny door next to the main entrance. It was used to sell wine to rowdy customers during the Medieval period (though the restaurant has only been around since 1880, so I'm not sure if this particular door was used). She also told us about the importance of the name "Buca" (meaning hole), which denotes the oldest restaurants in the city. The restaurant was quite full, but they still managed to find a small table for us. We decided to go all out for this one, ordering a bottle of chianti, followed by a bruschetta appetizer, steak Florentine from chianina meat, and wild boar with polenta. The thick-cut beef filet had been crusted in salt and charred on the outside, while still remaining a perfectly tender medium-rare on the inside. I haven't had a cut of steak that good in a long time, and I was pretty impressed while watching the chef cut off each giant steak and throw it on the grill in the open-air kitchen. While the steak was definitely my favorite, I also really enjoyed the rich flavor of the tender boar that fell apart into the creamy polenta when pierced with a fork. Though quite full, our waitress convinced us to round out our meal with a slice of apple cake with an almond crust (though I probably could have gone for more vin santo and cantucci). We got up at a decent hour the next morning, had some breakfast at the hotel, and then set out to see the Jewish synagogue, one of the biggest in Europe, just east of the old city. The synagogue was built in 1848 after Florence's Jewish community was allowed equal rights in the city. We were pretty excited to see the inside, but unfortunately a couple of school groups made it into the building before us, and since we had our backpacks with us, we would have to wait until they left that afternoon to use the lockers. Our train back to Milan left at noon, so rather than risk waiting, we decided to check out San Lorenzo instead. While San Lorenzo's exterior remains unfinished, the interior features colorful inlaid flooring and marble columns designed by Michelangelo. Thus, I found San Lorenzo to be much more impressive than the Duomo. It just felt more complete on the inside. Our last stop in Florence was to All'Antico Vinaio to get some sandwiches before getting on the train. I found this place on Yelp before we'd left, and since I love sandwiches (and so rarely find good ones in Stuttgart), I decided it would be a priority. Matt ordered the lampredotto sandwich and the roast beef sandwich with zucchini, tomatoes, eggplant, artichokes, basil, oil, and vinegar. I ordered the "Boss" sandwich with pecorino, truffles, and prosciutto crudo. My sandwich was the clear winner (Matt agreed with each bite) with its simple mix of crusty bread, salty ham and cheese, and earthy truffles. I think everyone else on the train must have been quite jealous! I have to say that despite our mishap with the train from Pisa to Florence, it was great that we were able to travel between the coast and the big cities without a car. Apart from our tickets between Milan and Florence, the trains were also pretty cheap and cost no more than 10€ per person to get from either Milan to Monterosso or from Riomaggiore to Florence. Two train rides and a flight later and we were back in Stuttgart and home with Leo (who'd had his own holiday). It's great to be back home, but I'm already starting to miss those long days of walking and eating. Until next time, Italy!